KJV 1 John 4:1 – Beloved, believe not every spirit, but try the spirits whether they are of God: because many false prophets are gone out into the world. These Hasidic Vipers of the Babylonian tradition, mainly led by the Chabad Lubavitch of sorceries and blasphemies and cause the kings of the earth to sleep with the Mother Mystery Harlot of the Earth, Mystery Babylon, of Sanhedrin are certainly leading all of mankind, whose names are not written in the Lambs Book of Life, into the lake of fire where Death and Hell will be cast, along with this Moshiach and his false Prophet. The Inhabitants of the earth have fallen away from the Truth for the leaven of the Pharisees. These Vipers who control the kings of the earth are daily manipulating their thousands of years plan, under the authority of that Old Dragon and Satan, to usher in his little kingdom, New World Babylonian Order, the masses are falling into this trap wholesale. These never understanding that these Hasidic jews are of the extreme North of Judah, and are of Samaria or the tribe of Dan. And it is the spiritual battle that they wage for their flesh against the true Spiritual Israel, who are they in faith of Christ Jesus the Lord God Almighty, who are the seed of Abraham by faith. However, since theirs is a flesh kingdom which they seek and not the Kingdom of God, they have schemed for hundreds of years to inculcate the lukewarm, who say they are of Christ, but do lie, and are made two fold the children of Hell, the proselytes of the jews. Thus they manipulate world events to deceive the masses and to have their flesh scheme and their harlot city plan. When the world awakens to the deception, the kings will converge upon that flesh kingdom to destroy her….and they will gloat. But because they too rejected the King of Kings, Lord of Lords, God Almighty will annihilate them all. But you, who know the Lord God Almighty, will do exploits against this beast they seek to “Reveal” that Man of Sin the Son of Perdition, this Moshiach ben David false Christ of the jews religion…the religion of MAN. One of the most troubling aspects of the recent violence and terror in Israel is the battle between truth and lies. Lies against Israel are easily accepted in every form and majority of forums, including major news outlets and governments. However, one of the most disturbing claims are those denying the existence of the Jewish Temples and the Jewish nation’s connection to the holy site. The Jewish Temples were, until now, a universal truth chronicled in the Jewish Bible, the Koran and the New Testament. 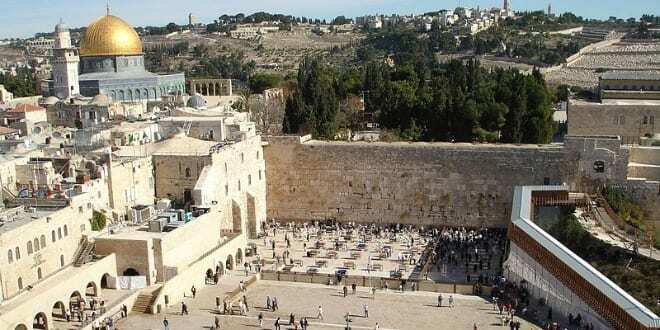 Nonetheless, the Jewish claim of a historical connection to their holiest site is being denied in mainstream press and in the international political arena. The New York Times recently published an article that claimed there is no corroborative archaeological evidence to substantiate Jewish claims of Temples on the Temple Mount. To deny this would seem incredible. 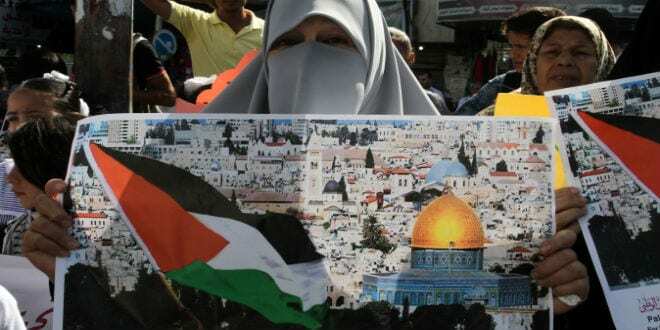 However, in an almost close call, a recently shot down proposal at the UN sought to cancel out all Jewish claims to the Temple Mount by Arab nations, including the Palestinians. While the Temple Mount was not wrested away from Israel, a UN commission declared the Cave of the Patriarchs in Hebron and the Tomb of Rachel in Bethlehem as Muslim holy sites. Such a move is nothing less than an unprecedented attempt to rewrite history. Similarly, France has made a proposal to the UN for an international force on the Temple Mount, also cancelling out Jewish claims. The Sefer Eliyahu describes a war of faith and religion, of the type being fought today. Sacrifices, or the modern equivalent, prayer, is at the center of the conflict, as the ancient book predicts. Today Jews or Christians praying on the Temple Mount is considered an act of aggression in the international press and a declaration of war. Though the recent conflict is violent, Rabbi Yekutiel Yehudah Halberstam, also known as the Klausenberger Rebbe, predicted this conflict with the Arabs after the Six-Day War, almost 40 years ago, and instructed his students on how to be victorious. According to Rabbi Mattityahu Glazerson, a world-renowned Bible Codes expert, the conflict between the “sons of Ishmael” and the Jewish nation is clearly spelled out in the Bible. Citing the rabbinic commentary known as the Pirke de Rebbe Eliezer, written 100 years before the beginning of Islam, Ishmael will challenge the Jews in the final days of the messianic process through “falsehood [which] will multiply and truth will be hidden,” precisely in the manner Israel is being challenged today. The Sheep hear their Shepherd, all others beware. Thanks – I read this article again due to your comment and this time I listened to the S Anderson sermon (and a second one where he describes very accurately why God is mad when people mock the sacrifice of his one son JESUS and gift of salvation). Now I’ll watch rest of building of temple June 2016 from your latest post. I appreciate your comment on the useless hireling shepherds (talmud evangelists) who care not for the sheep. When I witness Bible truth, people usually either complain about religious oppression, e.g. abuse of American natives – or else are completely caught up in “being blessed” thru ‘worship’ of spiritual Sodom and Egypt. Most people won’t broach the subject of spiritual eternity at all. My husband took me to earth Jerusalem and I walked through the water tunnels (knee deep) of the excavated David site – but I loved the Sea of Galilee where I could picture Jesus healing thousands and thousands and telling truths on the Kingdom of Heaven. I won’t be going back to the fleshly Jerusalem. Pastor Anderson has zero clue, and refuses to hear from me at all. (2) we tried to go the Bethlemen – but there were people in the streets – by husband thought there were threatening – but turned out what I perceive in retrospect – they were peacefule Palestinians – oh oh my heart sinks. (4) back to your posted third temple video – we visited the David City and took a tour through 2 feet of water etc. – and they had lots of excavation stories – But my gut was telling me – there’s a lot more to this “DIG” than meets the eye – I knew what if would emphasize before I even watched it . SO RP – keep up the good but sad posts ! I find them very enlghtening ! Delete as appropriate ….